Every time I fly into Phoenix I’m struck by its absurd geography. The flat surface of the Salt River Valley has been all but paved over with highways, parking lots, and sprawling development. But this mess of development is punctuated by mostly undeveloped mountains. Camelback, Lookout, Piestewa and the other mountains of the Phoenix range pop above the sprawl as if a giant randomly poked his figures through the surface from below. I know it is the development that encircled the mountains, but it looks as if it occurred the other way, as if the mountains suddenly rose up through the urban sprawl, shaking it off like a dog emerging from the water. 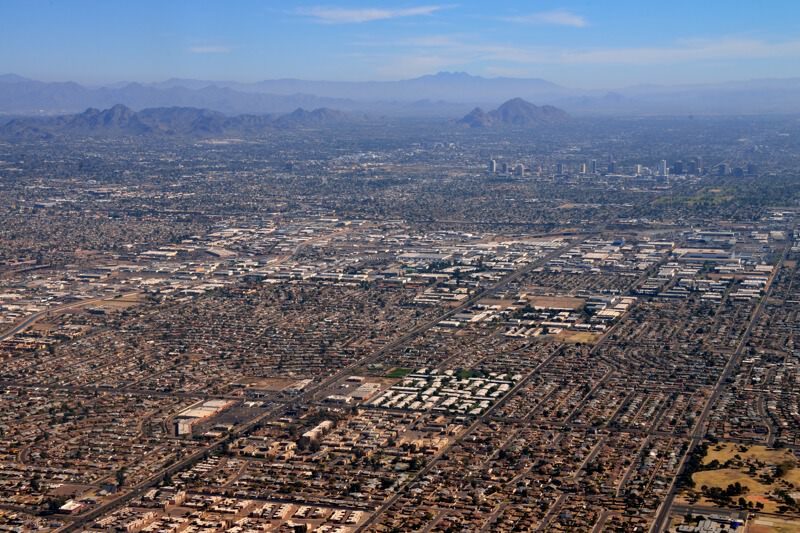 Phoenix is the hub of the Valley of the Sun — a sprawling metropolitan area that covers Maricopa County and beyond. It’s a region of nearly non-stop residential and strip commercial development where one city can be all but indistinguishable from the next. But it is also an area rich in arts, culture, history, nature, and opportunities for outdoor recreation. 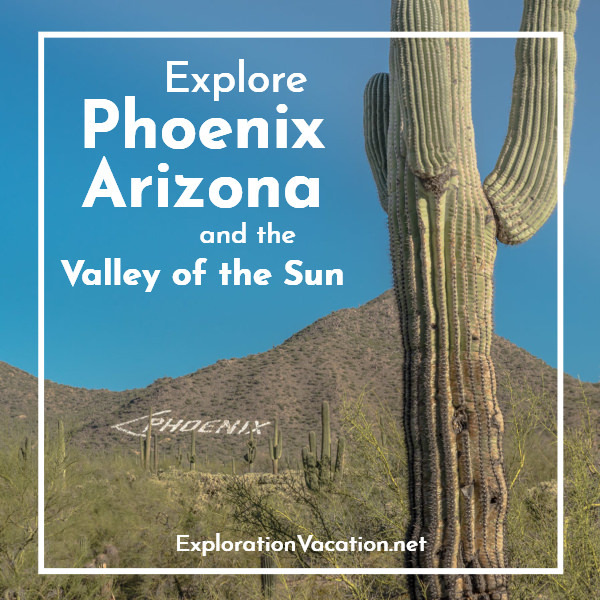 For purposes of this page I’ll try to stick to the Valley itself, but the Superstition Mountains, Tucson, Sedona, Jerome, and many other fascinating spots are an easy day trip from Phoenix, allowing for an almost endless array of options. Check the Arizona page for information on these locations and more. If you’d rather hear about the Phoenix and the Valley of the Sun, listen in on my conversation with Chris Christensen on his award-winning podcast the Amateur Traveler! I provide links as a convenience for you. However, some links may pay me a small commission if you use them to reserve a room, rent a car, or purchase goods or services. You don’t pay anything extra, but it helps keep this website running. And all affiliate links are for products or services I personally use and recommend. To learn more, review this website’s policies and disclosures. At the heart of it all is downtown Phoenix. Once rather desolate, it is now a cultural hub. The same is true for downtown Mesa. As in downtown Phoenix, the expansion of the light rail and the establishment of a major arts center is spurring a dramatic rebirth. Scottsdale has always been a cultural hub, with western galleries and auction houses crowding the downtown streets. There’s always plenty to see and do in Phoenix and throughout the Valley of the Sun. And, while Phoenix has long been seen as a retirement destination, there is plenty here for visitors of all ages and interests. Culture probably isn’t the first thing that comes to mind when you think of Phoenix. At one time that may have been accurate, but today Phoenix is home to a diverse and vibrant cultural mix. You can get a glimpse of this diversity in the variety of work on display in local museums, galleries, theaters, concert halls, and even right along the street! Open gallery nights and other evening events are popular too. These include the Thursday night Art Walk in Scottsdale and the monthly First Fridays in Phoenix. Phoenix is home to a wide variety of art museums and art centers. Housed in a cool modern building in the heart of the revitalized downtown, the Phoenix Art Museum has a lovely, nicely balanced permanent collection. It also offers a wide variety of interesting and unusual special exhibits, including regular photography exhibits drawn from the vast collection of the Center for Creative Photography at the University of Arizona. This small museum offers an ever-changing array of cutting-edge contemporary art, design, and architecture right in the heart of Scottsdale. The Heard Museum used to hold one of the country’s finest collections of American Indian art. After a change in direction a few years ago, it now holds the country’s finest collection of Southwestern Native American art. But it’s still an amazing collection. In addition to displaying historic and contemporary art and artifacts, the museum sponsors Native American performances and competitions, educational programming, and special events that support continued development of Native art and culture. Western Spirit is a relatively new museum, first opening in 2015. Its exhibits are theme-based and look broadly at the west and its people over time. Besides the two mostly-permanent historical exhibits on the second floor, visitors can generally expect to find an exhibit of contemporary bronzes, Western movie posters and memorabilia, Hopi pottery, and the Spirit of the West collection of cowboy memorabilia. These are supplemented by a variety of other themed exhibits that change a once or twice a year. A huge collection of western art, including cowboy art, bronzes, contemporary katsinas and other American Indian art, and historic basketry is hidden away in the corporate offices of the Basha grocery store chain down in Chandler, Arizona. The Eddie Basha Collection is the result of the collecting passion of two people. Zelma Basha’s amazing basketry collection inspired her nephew Eddie to begin his own collection of western and American Indian art. Most of the collection is organized by artist, providing a comprehensive look at the work of some of America’s finest Native and cowboy artists. In addition, a display of personal letters from the artists to Eddie Basha brings the collection and the artists to life. Unlike most museums, the Basha Collection is only open during regular work hours on week days. Arizona State University in Tempe has two art museums, the ASU Art Museum in the Nelson Fine Arts Center and the Ceramics Research Center at the Brickyard. Hours can be more limited at these museums than most others. The museum in the Nelson Fine Arts Center features a wide-ranging and always-changing schedule of contemporary art exhibits on the University campus. The Ceramics Research Center houses a world-class ceramics collection that draws scholars from around the world, but can also be viewed by the general public. Along with the main research collection, the museum has several small exhibits in various classrooms and work spaces, and hosts special exhibits in its large main gallery. The Brickyard is located in downtown Tempe. Mostly a classroom space, the Shemer Art Center in Phoenix helps the community create art. However, the Shemer also holds shows featuring local and regional artists in lovely bright galleries in a historic house. The Shemer is also the site for special events, including a semi-regular Micro-Dwelling tiny home exhibit. The Mesa Arts Center is a state-of-the art facility with classrooms, a performance hall, and a museum/gallery. The gallery, the Center for Contemporary Arts, hosts a variety of exhibits throughout the year. Located right off the light rail line in downtown Mesa, the Arts Center is surrounded by gardens, fountains, and outdoor performance spaces. The Musical Instrument Museum is in a class of it’s own. A museum visit includes a headset that allows visitors to hear the featured movement while moving between exhibits. Permanent exhibits present a wide variety of musical styles from North America and around the world through musical instruments, photographs, videos, and, of course, audio. Special exhibits vary wildly and have included costumes worn by women rock artists and inlaid design on musical instruments. The museum also has a wonderful space for live performances. Part history museum, part art museum, part performance space, this one-of-a-kind museum truly has something for everyone. The Valley of the Sun and surrounding mountains have bee inhabited for over a thousand years. Miners, mountain men, and the military had a presence in the area in the 1800s, followed by farmers and other settlers who created the modern Phoenix area. Western Spirit: Scottsdale’s Museum of the West has a significant collection of historic Hopi pottery, artifacts from the western frontier, and western movie memorabilia. It also has a large permanent exhibit (on loan) of historic items related to western exploration and Native American life. The Heard dedicates a significant amount of space to its People of the Southwest exhibit, which includes a mix of historic and contemporary pieces, and to its boarding school exhibit, which is largely a history exhibit. Those wishing to dive into Arizona’s history will find a number of options at smaller museums around the Valley of the Sun. The Superstition Mountain Museum celebrates the area’s history through exhibits on mining and an Old West town created from replica buildings and movie sets. Some of the mining equipment is operational and can be seen in operation during special events. The museum is in a stunning location at the foot of the Superstition Mountains in Apache Junction. Arizona’s state capitol complex includes the historic 1901 statehouse, which serves as the Arizona State Capitol Museum. The museum includes restored rooms and exhibits on state history and the USS Arizona battleship. Outside, the Wesley Bolin Memorial Plaza features monuments recognizing significant people in Arizona history, the armed forces, and more. There are couple of house museums in the Phoenix area that offer a glimpse of life in the Southwest in days gone by. The Rosson House is an 1895 Victorian that sits in historic Heritage Square. This quaint block was developed as part of the original plat for the city of Phoenix. The house can be visited on a guided tour. The Niels Petersen House Museum in Tempe was constructed in 1892, making it the Valley of the Sun’s oldest Queen Anne-style home. It’s open seasonally for tours. Christmas is an especially nice time to visit, as the home is beautifully decorated for the season. Phoenix and the surrounding area has been inhabited for over a thousand years. Several museums bring this history to life. Although little remains of the ancient pueblo that was once located in Phoenix, the Pueblo Grande Museum and Archaeological Park sheds light on the lives of those who lived here many generations ago. In the north of Phoenix, the Deer Valley Petroglyph Preserve and Interpretive Center is much more than a museum. The engaging and informative interpretive center provides a wealth of information on the ancient people of the Phoenix area and the images they left behind. However, the star of the show is outside, where a rocky hillside still displays hundreds of petroglyphs. South of Phoenix, Casa Grande Ruins National Monument preserves the remains of a large pueblo community. One very large structure remains, but there is also an excellent museum at the site. I’ve never visited the Arizona Science Center, but it has a good reputation — especially if you are traveling with children. It features a wide variety of STEM (science, technology, engineering, and math) and natural history exhibits. The complex includes an IMAX theater and planetarium. While Phoenix has very few frontier-era buildings, architecture fans will find a bit of Art Deco, construction by or inspired by Frank Lloyd Wright, lots of mid-century modernism, and a smattering of recent masterpieces. Visitors might be surprised to discover that the city of Phoenix has 35 designated historic districts (you can see a map of them here) and has more than 200 historic sites and districts listed on the National Register of Historic places. However, spend a little time driving around the older areas of Phoenix and you’ll quickly discover block after block of homes built between 1920 and 1960. Mid-century modernism is celebrated each winter during Modern Phoenix Week. This annual event features a large number of tours and lectures. It’s a great way to see some classic architecture and get in touch with Phoenix during an important growth spurt. However, tickets sell out quickly, so keep an eye out if you want to attend. Frank Lloyd Wright built his winter retreat and architectural lab Taliesin West in the wilderness that today is part of urban Scottsdale. Architecture students still study here at the school established by Wright. A tour of the site provides insight into Wright’s thinking, as he carried out a number of architectural experiments here. Designed by a student of Wright’s, the Phoenix Biltmore has the feel of a Wright building, with a few features that aren’t quite consistent. For years the choice of visiting celebrities, the bar is a great spot for a drink. A desert community may seem like an odd place to find spectacular gardens, but many Valley cities have wonderful landscaped areas. There are also a couple of wonderful gardens in the area. Located right in Phoenix, the Desert Botanical Garden combines the best of domestic landscaping with native desert vegetation. It’s a great place to wander and get an introduction to the desert. A recent rehabilitation of parts of the garden have made this beautiful garden even better. It’s gorgeous at any time of year, but particularly fabulous in spring when the flowers and cacti are in full bloom. And, for a truly magical experience, visit the garden during a special lighted evening event. As hard as it may be to believe, I’ve never been to Phoenix’s Japanese Friendship Garden. This tiny garden is located right in Phoenix. Located near Superior at the far southern edge of the Phoenix metropolitan area, Boyce Thompson Arboretum is worth the drive. In some ways similar to the Desert Botanical Garden, Boyce Thompson features a mix of domestic and native plantings. However, as you might guess from the name, there are also a lot more trees. The landscape is also more diverse, as the arboretum includes mountain slopes, canyon, and river valley. In many ways it is more of a mountain park with flowers than traditional garden. And, in spring, it is absolutely spectacular. Phoenix has a lovely, kid-friendly zoo. I visited with my friend and, honestly, we spent most of our time riding the tram and catching up, rather than watching the animals. The zoo has lovely landscaping, cooling fountains, elaborate Christmas lighting, and a variety of special events, making it a good escape throughout the year. The Phoenix area is a wonderful place for fans of desert landscapes and hiking, with many parks within the city and trails winding throughout the surrounding mountains. The city and surrounding communities have a large number of parks and recreation areas that let visitors experience the desert up-close. And, with so many options, there is sure to be a path suitable for everyone. Anyone who has ever flown into Phoenix has seen Camelback Mountain, the city’s signature natural feature. Despite its very urban location, Camelback Mountain offers a number of hiking options. Note, however, that it can get very busy during winter and spring. At the other end of Phoenix, South Mountain Park offers 16,000 acres of hiking over three mountain ranges. There is plenty of desert scenery and even a few petrogylphs. This is a popular spot for sunset viewing, but expect crowded roads during peak periods. Located in northern Mesa, Usery Mountain Regional Park offers visitors a wide range of hiking options in a beautiful desert location. At the north end of the Phoenix area, Cave Creek Regional Park offers a range of trails through varied desert topography. It’s another beautiful place for a hike at any time of year. Located at the far eastern edge of the Valley of the Sun, Lost Dutchman State Park covers the lower slopes of the Superstition Mountains and connects to trails into the mountains. One of my favorite places at any time of day, it’s an ideal spot for watching the sun set. A little farther afield, Saguaro Lake offers a range of water-based activity in a striking setting northeast of Phoenix. There is a full-service marina on the lake, as well as a paddle wheel boat that gives tours. At the far eastern edge of the Phoenix area, the Apache Trail Historic Road takes adventurous drivers through the Superstition Mountains. This is one of America’s great drives, but nervous drivers should stop at Tortilla Flat! I’m not much of a sports fan, but I do like a baseball game now and again. Phoenix is the home base for the Cactus League’s spring training, assuring plenty of winter baseball activity. Cactus League teams include the (World Champion!) Chicago Cubs, the Arizona Diamondbacks, Chicago White Sox, Houston Astros, Kansas City Royals, Los Angeles Angels and Los Angeles Dodgers, Milwaukee Brewers, Oakland Athletics, San Diego Padres, San Francisco Giants, Seattle Mariners, and Texas Rangers. With so many teams in the area, it is possible to spend all afternoon and evening at a game. Games are played at a variety of stadiums located throughout the valley.Wherever you are, there is probably a game nearby. The Phoenix metropolitan area is vast and includes many distinct municipalities. While light rail stitches a number of these together, visitors wanting to move beyond downtown Phoenix, the downtown arts district, ASU in Tempe, or downtown Mesa will need a rental car. Phoenix is infamous for its long distances (urban sprawl) and dependence on private automobiles, but the valley does have a transit system that includes a light rail line with a connection to the airport. While there are plenty of areas in the valley that you simply can’t get to without a car, you CAN enjoy a car-free visit. Phoenix is a good place for foodies. While there are still plenty of mediocre spots around, there are many, many wonderful places to eat at all price ranges. They aren’t always located where you might expect though. . . don’t be surprised to find a great restaurant tucked into a strip mall. Because driving distances can be so long, it usually makes the most sense to look for lodging in the part of town where you want to spend most of your time. There are major chain hotels of all levels of quality throughout the urban area. However, if your lodging is more than just a place to stay, keep in mind that the area where you stay will influence your experience. The following are gross generalities, but it provides a little guidance if you seeking a particular type of experience. The Phoenician is probably the most exclusive luxury resort hotel in Phoenix. But you don’t have to spend thousands of dollars a night to have a luxury experience – Phoenix has many options at a range of price points. And, if you travel off-season, you might find some very good deals. The vast majority of luxury resort hotels are located to the north of Camelback Road. There are lots of options in Scottsdale, but there are also a number of lovely places in Phoenix all the way up to the very northern edge of the metropolitan area. I’m not really a luxury traveler, but we stayed at the JW Marriott Desert Ridge Resort one year (off-season when we found an amazing price) and we’ve had lunch at a couple other beautiful spots. Marriot Desert Ridge Resort has everything you could ask for in a luxurious southwestern resort. We snagged a great deal here a number of years ago, and I’d love to go back. It was lovely and ridiculously relaxing. Check reviews, compare prices, and book your room at the Desert Ridge Resort through TripAdvisor, Booking.com, Hotels.com, or Expedia. Check your luxury options and then book the perfect luxury stay through TripAdvisor, Hotels.com, or Expedia. For a more urban experience, look for a hotel or condo in downtown Phoenix, Scottsdale, or Tempe. Any of these will put you in close proximity to a variety of bars, restaurants, and cultural options. Downtown Phoenix is actually pretty quiet most of the time, so those looking for a little more (or a little later) nightlife might want to consider Tempe. With its proximity to the university and a dense cluster of newer housing, shops, restaurants, and bars, Tempe probably has the latest hours and liveliest nightlife of any place in the Valley. Should you want to get by without a car, either downtown Phoenix or Tempe is a good option. Note that there seems to be a surprisingly limited number of hotel rooms in downtown Phoenix, although there may be condos available as well if you are traveling off-peak. I’ve only stayed in the urban core of downtown Phoenix once, and that was at a rather dumpy Choice Hotel after arriving on a very late flight. I know there are other options. Take a look at TripAdvisor, Booking.com, Hotels.com, or Expedia to see what’s available and book a room. Be sure to check the map, as lots of “downtown” options aren’t actually downtown. For hotels in downtown Scottsdale, TripAdvisor and Expedia are a little better at sorting for downtown options, although you still need to check the map carefully. Airbnb doesn’t list much in the way of condos or apartments right in the downtown areas, but there are a few, so it’s worth checking. That’s particularly true for off-season travel. To live like a local, stay in one of the many historic neighborhoods in Phoenix or in the older neighborhood around downtown Mesa. If you’re trying to visit Phoenix without a car, the historic neighborhoods in both cities are generally pretty accessible by transit. We’ve stayed in Airbnbs in both areas and really enjoyed being in a neighborhood of charming older homes. In years past we’ve stayed at the ZenYard Guest House in the northern part of Phoenix. We really enjoyed our stay there, but the property seems have changed hands and then closed. We’ve also stayed at an Airbnb in the historic Willo neighborhood just west of the Heard Museum. This is an attractive area within easy walking distance of the Heard, PAM, Roosevelt Row, and the downtown business district. Over in Mesa, we stayed at an Airbnb in the historic neighborhood adjacent to the old downtown. This is another quiet area with a mix of attractive older houses. Airbnb is the best option for finding lodging in the historic neighborhoods of both Phoenix and Mesa. In either case, be sure to check the map to see that you are actually in one of the walkable historic neighborhoods! I love the Sonoran Desert and my mother spends the winter out in Apache Junction, so generally I stay at the far edge of the East Valley in eastern Mesa, Apache Junction, or Gold Canyon. (I love seeing the Superstition Mountains from my window!) Many of the units in this end include great views or, at least, a yard filled with cacti and quail. Hotel options this far east are a little limited, so I usually book an Airbnb. But not always. The Best Western in Apache Junction is a good value. The rooms are large and have decks. Service is always friendly and efficient. However, it’s located along the main commercial strip, so it’s not super quiet until quite late. We’ve stayed at a variety of Airbnbs, usually stand-alone casitas or cabins if we can get them. A couple favorites include the Goldfield Getaway (with great views and a great Arizona library) and the Gold Canyon AZ Historic King’s Ranch Adobe Cabin (a 1948 cabin with sweeping views in all directions). A couple other favorites are no longer available. Book early because all of these sell out during the peak season. There are a couple of hotels (including another Best Western) and resorts in Gold Canyon. I’ve never tried them, but they are worth looking into if you want to stay in a serviced property at the foot of the Superstitions. You can also read reviews, check prices, and book your room for those online at TripAdvisor, Booking.com, Hotels.com, or Expedia. Check Airbnb to book a room, casita, RV, or cabin by searching for Apache Junction. (That’s where these links will take you.) That should also bring up rooms in eastern Mesa and Gold Canyon.) 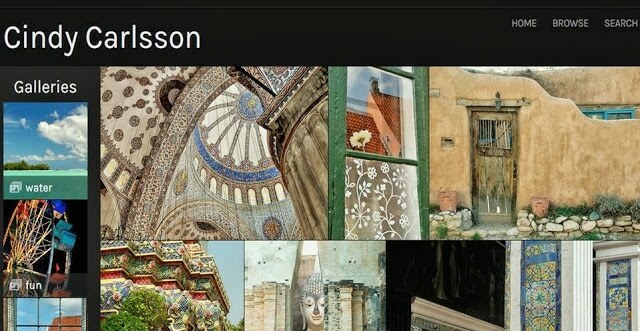 And, as always, if you haven’t tried Airbnb, use this link to save $40 on your first booking. Even with all the online resources, sometimes a good book is what you really need. Moon Phoenix, Scottsdale & Sedona by Lila Menconi seems to be the only standard guidebook from a major publisher that focuses on Phoenix. There used to be an a good Insider’s Guide to Phoenix and Scottsdale, but it appears it isn’t being updated anymore. If you find a recent edition, grab it and let me know! 60 Hikes within 60 Miles by Charles Liu seems to be the classic and you’ll find it on every bookshelf in Phoenix. My copy is usually in my luggage (or stashed at my mom’s house) whenever I’m in Phoenix. It’s an easy-to-use guide with a good selection of trails. Moon Take a Hike Phoenix: Hikes within Two Hours of the City by Lila Menconi isn’t one I’ve used, but looks like a well-designed and useful guide to hiking in the Phoenix area. I like that it allows you to identify hikes by interest areas like historic sites, wildlife, and wildflowers! Footloose from Phoenix: Some Pretty Amazing Hikes by Ted Tenny has fewer (and mostly longer) hikes than some of the other guides, but the detailed information on the trails he covers makes this a worthwhile guide. I’m not a mountain biker, but I know there are mountain bike trails all over the Phoenix area. If you are interested in getting out on those trails Mountain Biking Phoenix by Bruce Grubbs looks like a guidebook you should check out. A Brief History of Phoenix by John Talton isn’t a book I’ve seen before, but it looks like a good read for anyone who wants to understand how modern Phoenix came to be. This might be the next addition to my collection! Phoenix Then and Now by Paul Scharbach includes historic pictures of Phoenix alongside contemporary photographs of the same scene. We are going to Scottsdale for two weeks this October. Hope to get great ideas from your postings here, for interesting places to visit. We have been there several times…but always looking for something new to see and do. Oooh. October should be beautiful. I’m guessing you haven’t been to Western Spirit, Scottsdale’s relatively new museum of Western Art. It has a pretty wide variety of exhibits, so I’m sure you’ll find something. Catch me later for some more ideas!